Take away the screaming headlines, and there's one person who has consistently spoken about our sport with common sense since first tipping up at Silverstone and giving the jitters to Hill, Schumacher, Coulthard et al. 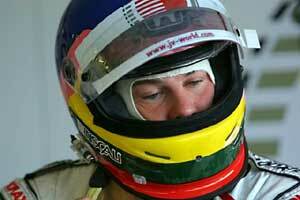 The hair color may be less dramatic, and he may not have stood on the middle step of the podium for some four years but Jacques Villeneuve remains as relevant a mouthpiece for motor racing as ever he was. Already I'm detecting a little resistance to this opening gambit. Surely, says popular opinion, this is the man who was all-but gagged by the FIA for chucking a few verbal bombs around about safety and the removal of Formula 1's wedding tackle - and more recently had that most public of spats with Juan Pablo Montoya. The trick is, as I said, to remove the exclamation marks that have been put into Jacques' words in print. It is on the subject of safety that Villeneuve has again spoken with balance, concern and the gravitas of a former world champion, as the specter of opening corner intimidation has loomed over F1 once more. Quite naturally he doesn't want to be among 20 cars bearing down on the accident when it happens, but he's also the only person in the whole of Formula 1 to have looked at a far greater concern. "Younger racers obviously look at what is happening in F1 and who is winning," he observed, "and that is the example that is being followed." Now remember, cast aside any thoughts of 'Villeneuve Slams Schu' for a minute. There are more and more young drivers cramming into the training grounds of karts and the junior formulae, all of whom want to be Michael Schumacher. So when Michael's actions say that no risk is too great in order to assert yourself over your peers and achieve your ambitions he has a captive audience ready to follow the master's lead. I don't believe that Villeneuve's comments are merely an exercise in 'Michael bashing'. There is, after all much that every aspiring driver can learn from the reigning world champion - be it physical preparation, integration with the team or the black art of producing those unbelievable lap times on cold tires, the wrong tires, in the wrong gear and in all weathers. These boys do not, however, race within carbon fiber survival cells, nor indeed on circuits that offer an endless gravel eiderdown to gather them up if things go wrong. If you have never been to Castle Combe or Croix en Ternois or almost any circuit not maintained at the standard required for Formula 1 then try it... and you will be shocked. A couple of years ago I ended up not only being an enthralled admirer of junior racing but also responsible for administrating a couple of championships. It's a demanding, time consuming way to slog through a season and a good deal more fraught than any other role I've been honored enough to have held . At the mundane end of things you have team managers threatening your kneecaps every couple of races and racing parents telling you that little Tarquin is a future world champion - so therefore the 17 drivers who finished in front of him must be cheating. Worst of all, though, is the sense of moral responsibility for the well-being of these youngsters and, as importantly, their families and friends. At one meeting a car ended its race upside-down in a neighboring field, a pall of smoke rising and no word coming through on the condition of the driver. Standing impotent in the pit lane, struggling to maintain an air of professional calm beside his father was not the sort of experience I live for. Especially not when reassuring words to an anxious family had already rung hollow earlier in the season and ended in a church filled with the team, family and schoolmates of a very talented young driver. Make no mistake: neither of those incidents can or should be blamed on any circuit, car manufacturer or merely upon the example set towards which young drivers aspire. But when the inherent danger of motor racing is used as a means to intimidate a rival into capitulation, that cannot be acceptable. It certainly is not to those who continue to look after the needs of young racers hell bent on getting to the top. As a result Villeneuve is asking for clarification of the rules so that nobody, from the wildest rookie to president of the Grand Prix Drivers' Association, can interpret it in anything other than a safety-conscious manner. Doubtless it will draw considerable fire within the paddock, but that's never been something to particularly trouble Villeneuve who is in his sixth season of obstinately following the beat of his own drum. "Everyone knows why it was written and everybody understands it," he said. "It was written so you don't put someone on the grass, so you don't force someone else to hit the brakes. I guess if you just read it as it's written then it allows you to move at any time. That's not the intention of the rule." Villeneuve is not alone in his fears. Eddie Irvine too has expressed similar concerns over the potential for mishap at the start of a Grand Prix - albeit couched in the familiar 'couldn't give a xxxx' swagger. It's a useful tool for Irvine, that attitude, in that it keeps him at a distance from both the brickbats and bouquets of the paddock - yet it's quite ironic that the two 'renegades' of F1 are the ones lobbying for an improvement in driver conduct. Of course only the FIA can actively do anything about driver behavior. In recent times it has - it banned Irvine at the start of 1994 and gave Villeneuve a royal dressing-down for his criticisms in 1997. Meanwhile those who dedicate themselves to making the racing better and safer for the army of hopefuls can only watch them charge into the first corner of each race and hope that they follow the example of the renegades until such time as the governing body acts to make for better racing and a better example for all.